Face the deep freeze with a warming cup of homemade soup. Beyond reaping the nutritional benefits of a pureed vegetable soup, my favorite part is simply holding the cup; warming my constantly chilled hands. 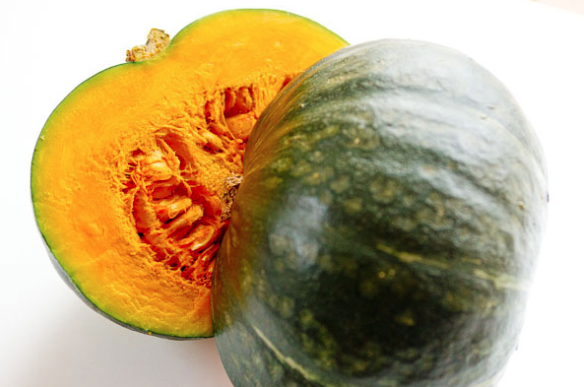 And if you are looking to change it up a bit, try KOMBOCHA squash. A staple of Japanese cuisine, Trader Joe's has called this "a pumpkin dressed in a green Halloween costume". It is creamy without any added cream and has a deep, rich flavor. Be creative with your flavor boosters--I have listed a few of my favorites. Preheat oven to 400°F. Season kabocha halves generously with salt and pepper, drizzle each with 1 tablespoon olive oil, and place flesh side down on a baking sheet. Bake until browned and tender, about 35-45 minutes. Sauté onion & garlic and until golden in olive oil. Add salt & pepper to taste. When the squash is cooked, let it cool slightly, then scrape out the flesh and add it to the onion & garlic. Add one cup of chicken or vegetable broth. Cover and cook until tender about 12 minutes. Puree using an immersion blender or put soup in blender or food processor to puree until velvety smooth. Return to pan with remaining two cups of broth. Add splash of juice or cider and 1 TBS of maple syrup or honey. For a more sweet/spicy taste, add in a dab of siracha or pureed chipotle peppers. Cook on low heat until flavors are well blended---about 15 minutes.